Chicago was our first stop. 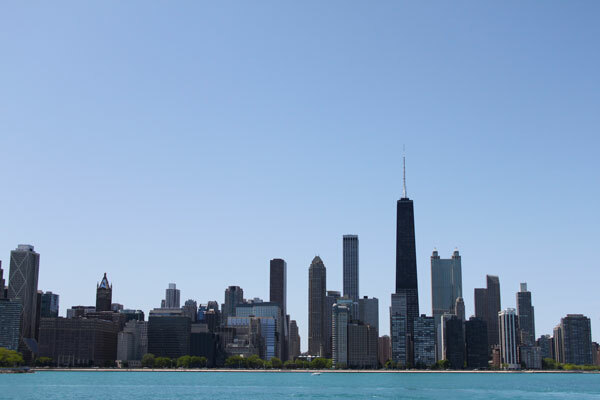 We flew with American Airlines from Manchester direct to Chicago O’Hare – a 7.5 hour flight that I actually quite enjoyed due to the regular free drinks and snacks, delicious spinach pasta lunch and the second Game of Thrones book. We stayed with Rob’s sister (shout out to the best sister-in-law ever for having us to stay) so I have no hotel information to share, but the area was lovely (right near Lake Michigan) and it was really easy to get around the city from our base. 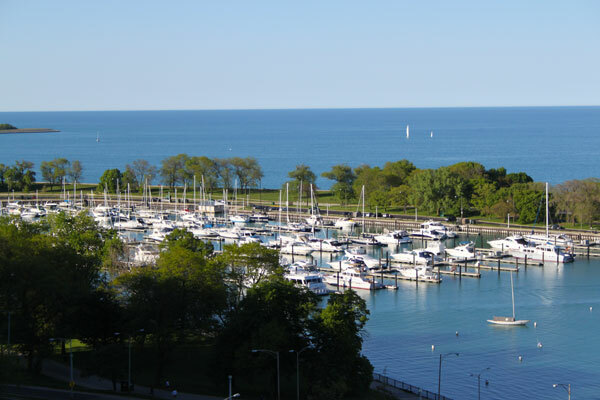 The weather was beautiful during our stay so a walk around the Lake Michigan harbour was a must – it’s the biggest lake I’ve ever seen (and I’ve been to the Lake District), taking 20 minutes to fly over and prompting me to ask Rob ‘which ocean is that?’. Down by the lakeside there’s plenty of seating along with grassy areas and a running/cycle track. If we’d been around longer I’d have loved to rent bikes and cycle around there. The Willis Tower (formally known as the Sears Tower) is the tallest building in the Western Hemisphere, and we went all the way to floor 97! The views of the city are spectacular and if you’re feeling brave, you can inch your way out onto the perspex boxes that jut out from the side of the building and look down to see the city right beneath you. 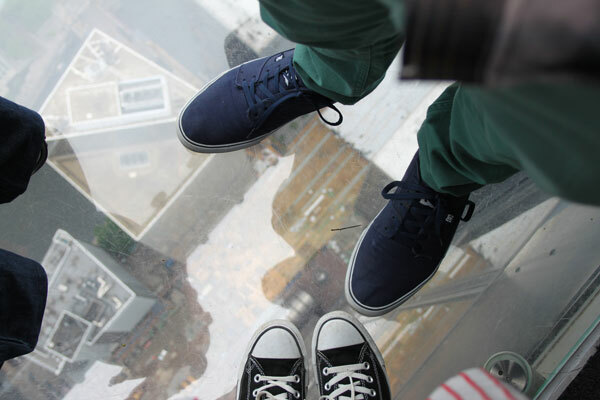 This was my second favourite Chicago experience. 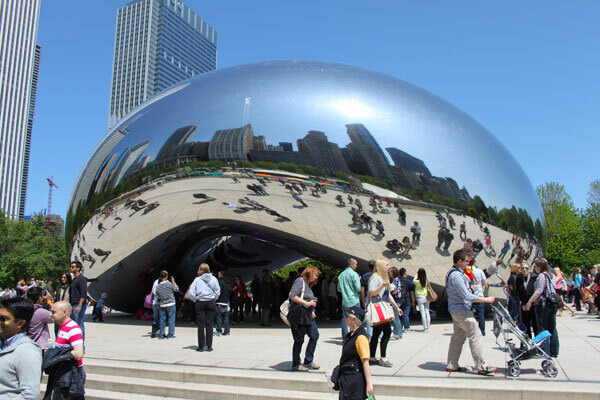 The Bean is a huge metallic bean (as you’d expect) that sits right in the heart of the city and reflects its magnificent skyline. There’s much fun to be had at the Bean – lean your head against it, lie down underneath it, step back for a photo and try spot yourself in the crowd… it’s ace! Right next to the Bean is this water feature (which has a name I forget and is un-Googleable) – the two brick structures on either side project images of Chicago locals and spill water onto the paved area below, providing the perfect playground for kids and childlike grown-ups. It was a lovely way to cool down after a hot and hectic day. Oh, so beautiful. 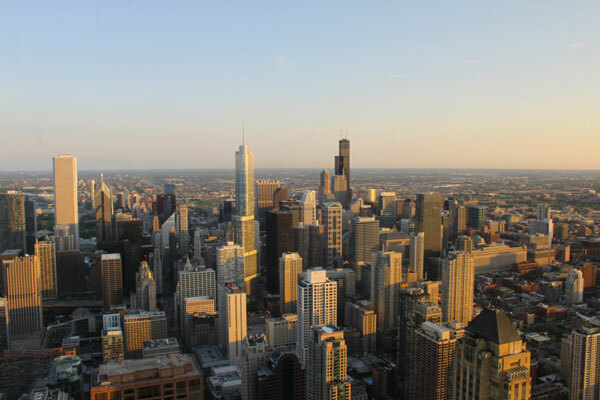 For me, the highlight of our time in Chicago was cocktails in the Hancock Observatory at sunset. We headed up at 7.30pm and had a short wait for a table, in which time I nipped to the loo to take the first photo here – the ladies has the best view! 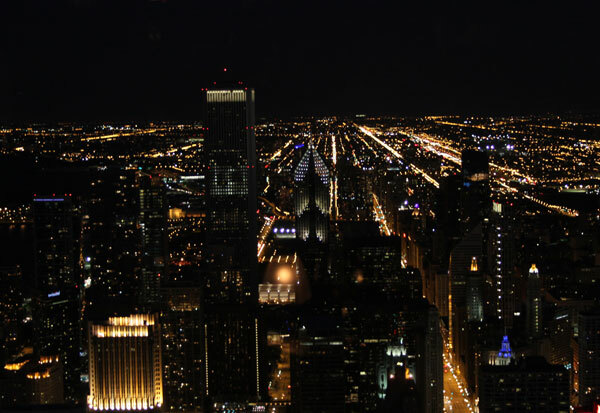 We were very lucky to get a table right near the window, so we just sat and watched as the city lit up all around us. The cocktails were amazing too – try the Pear Martini! Gospel Brunch at House of Blues – Sundays only, delicious southern food. Try the grits! New York was our second stop – we flew with Jet Blue from Chicago O’Hare to JFK which took about 2 hours. When we cleared JFK we jumped in a taxi – the flat rate fare of $50ish seemed reasonable enough with two huge cases! We stayed at Hotel 17 on East 17th Street and I’d absolutely recommend it if you’re travelling on a budget, or even if you’d just rather save your pennies for shopping. 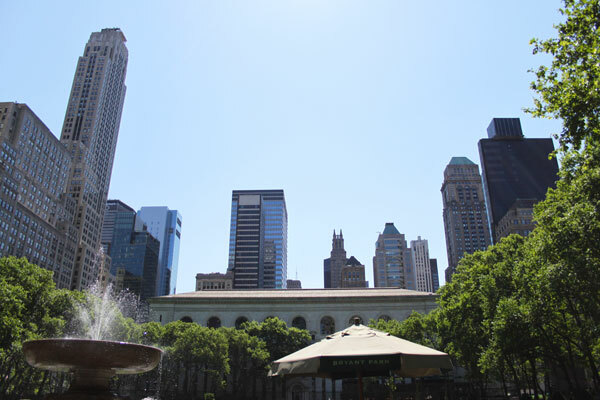 It’s bang in the centre of Manhattan which makes it a great base for exploring. The rooms are basic but not shabby, with a (slightly uncomfortable, granted) double bed, wardrobe and dresser with TV and safe, and a sink unit. The bathrooms are shared – there are four on each floor with a shower, sink and toilet – but they were spotless and we never had to wait. We paid around £500 for four nights which is an absolute bargain in NYC! If you want to really feel part of New York and not like a tourist, walk over the Brooklyn Bridge. We walked from our hotel down to the bottom of the island to see the Statue of Liberty, but rather than going across the Hudson River to see her close up, we headed for Brooklyn instead. 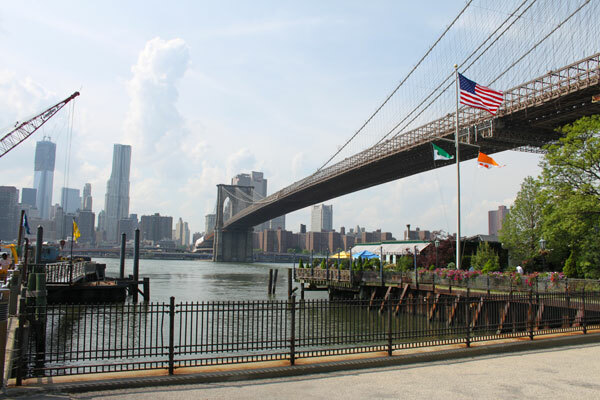 The bridge is a vital connection between Brooklyn and Manhattan and is used by all manner of people – it’s busy with tourists and locals alike. It was a hot and humid day when we crossed which wasn’t ideal (it was very, very hot!) 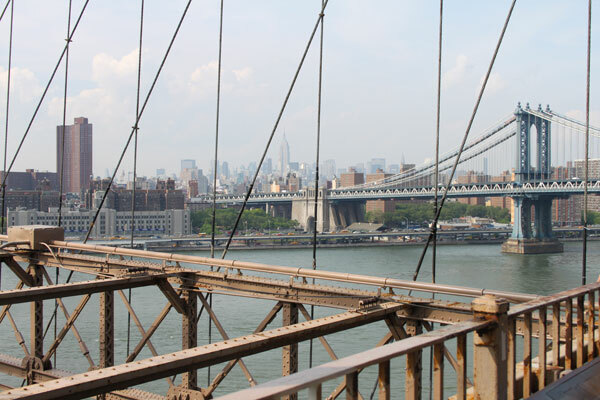 but the views are magnificent – both of the skyline and the bridge architecture. When we reached Brooklyn we spent a harried half an hour searching for the famous Grimaldi’s Pizza, which we finally found then promptly left – it was far too hot to sit in a restaurant with an open pizza oven! It’s a very busy place so be prepared to wait if you’re determined to grab a slice, but if you’re not too fussed head further down the road to one of the many cafés and restaurants with outdoor seating. DUMBO stands for Down Under the Manhattan Bridge Overpass and is the name of the community that sits under the bridge. It was wonderful just to walk around here – there are lots of parks and green, open spaces, and right under the bridge is the Brooklyn Ice Cream Factory which was delicious. We also headed into Downtown Brooklyn for some thrift shopping at Beacon’s Closet – read more about that here. 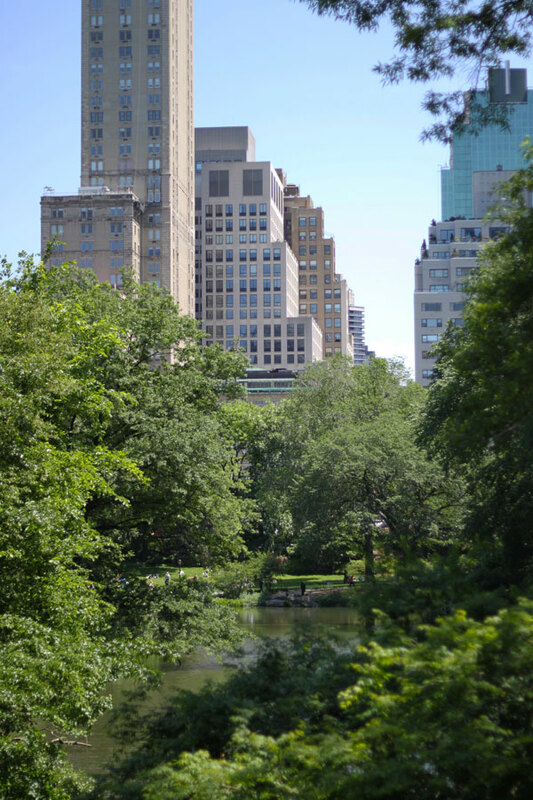 If you want a break from the hustle and bustle of city life, Central Park is your place. I was amazed at how utterly peaceful it was once we entered – the only clue we were in New York was the looming skyline. We popped into the Whole Foods across the road – it’s inside the Time Warner Center which is directly opposite the park and on the Columbus Circle subway stop. Whole Foods is insane – so much goodness in one place that you can pack up and take across the road as a picnic. Bikes are available to rent and the competition for custom is fierce, with prices ranging from $10 to $36 for a two hour ride. In the end we explored on foot, clambering over rocks, chilling on the grass, discovering hidden waterfalls and even watching a baseball game. 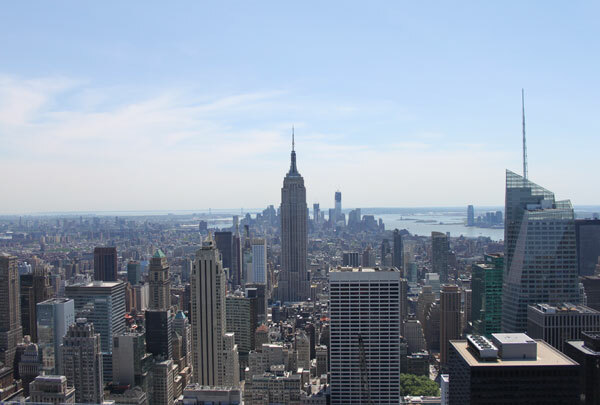 Lots of people recommended Top of The Rock, the Rockerfeller Center’s observation deck, over the Empire State Building for views of the city and we couldn’t have wished for anything better. We went up on a beautifully clear day and could see for miles. You have the option of stopping at floor 67 where perspex sheets separate you from the view, or you can carry on up to floor 70 where the city sprawls out beneath you with nothing in between. 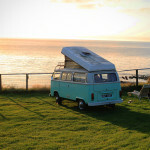 The scene is spectacular and even better experienced out in the open air – you feel like you can just inhale the beauty. We were absolute tourists and had our photo taken by the professional photographer, but the image of Rob and I with the skyline behind us was well worth the $20. Our hotel was in the Gramercy area of New York which sits right beside Union Square. I loved Union Square – it felt so relaxed and laidback, with none of the pushing and shoving of Times Square but all the NYC magic. 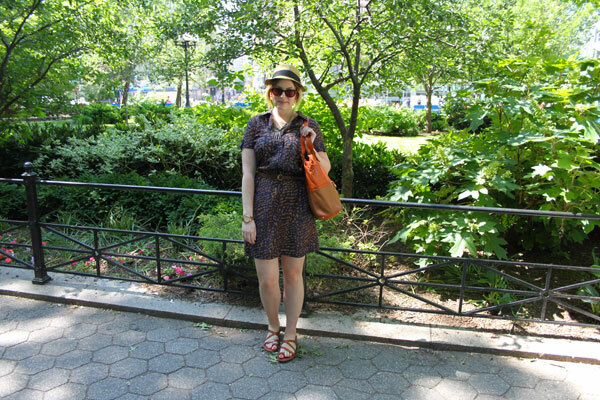 The park was a great place to eat breakfast – sitting on the steps with a Starbucks, just watching the world go by. One day we stumbled on an outdoor spin class, another day there was a farmer’s market – it was wonderful. The West and East Villages – I loved them both and felt so at home here. Plus there are some amazing ramen noodles to be had! Gravy – really delicious southern-inspired food. The tomato pie was immense! 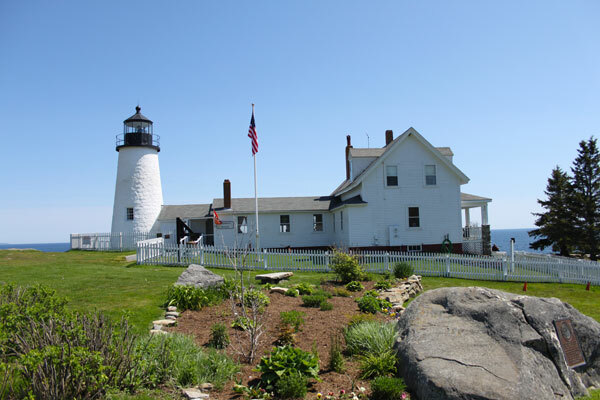 Maine was the last stop on our roadtrip and we were more than ready to enjoy the laidback life after visting two thrilling cities. We flew Jet Blue from JFK to Boston where we stayed the night – sadly we didn’t get to see much of Boston as we arrived late and left early, but I’d love to go back. After a restful night we hired a car and drove from Boston to Augusta in Maine, which took around 3 hours. It was a beautiful drive – Maine is a luscious state filled with greenery and breathtaking scenery. It’s easy to see why this part of the US is called New England – the views reminded me so much of Yorkshire. You can’t visit Maine without eating lobster. We ate at Shaw’s, a fish and lobster restaurant on the coast. 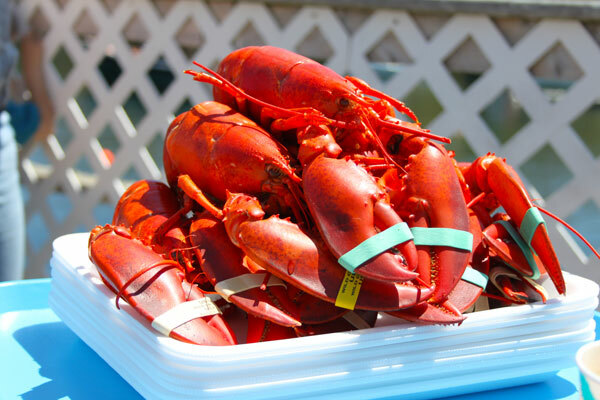 The lobster are freshly caught, cooked and served with fries, melted butter, steamed clams and onion rings. I’d never eaten a lobster like this before – I think the trend in the UK is to open them up before serving so the meat is easy to get at, but I loved the challenge of breaking open the shell and picking out the goodness inside! 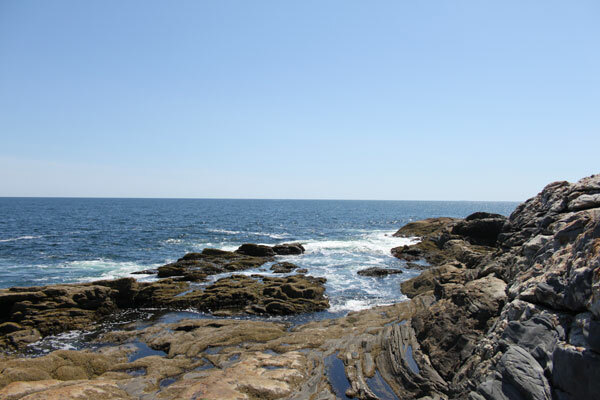 Maine sits on the coast of the Atlantic Ocean and the rockery landscape by the sea is stunning. We visited this lighthouse (which I just can’t remember the name of OR find on Google – America! Get your landmarks online!) and spent some time scrabbling over rocks and poking about in rockpools. 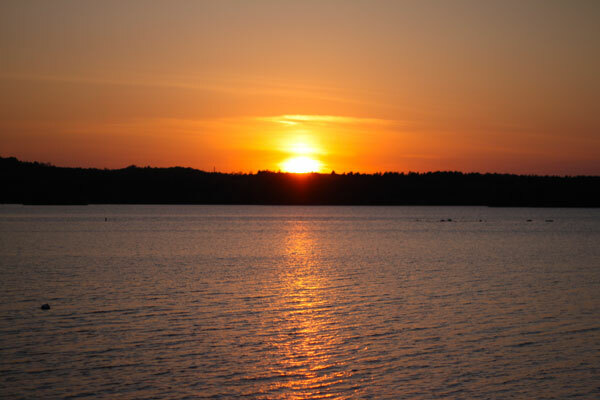 In Maine, there are lakes everywhere and water seems like a key part of life. We stayed with Rob’s family who own a boat, so we were lucky enough to take a ride as the sun was setting. 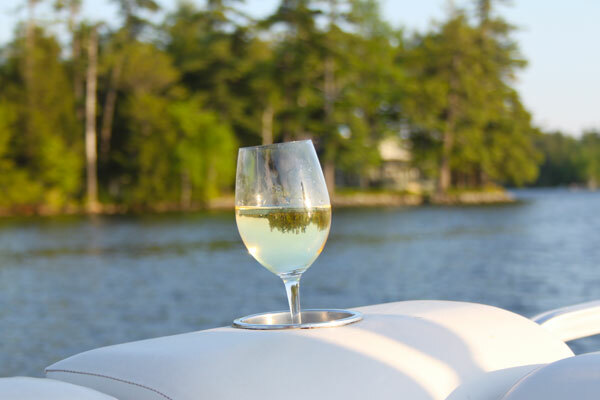 Sitting back with a glass of wine and watching the scenery float by was the perfect way to end our holiday… although my glass fell into the lake a few seconds after Rob snapped this photo! Home – American cook-outs are the best! If you’re flying into Boston then heading up to New England, take the bus to and from the airport. It’s huge, airconditioned, with free movies, snacks, drinks and WiFi. We got on at Augusta, changed at Portland and were at our terminal in 3 hours. So, that’s my guide! Obviously we only visited a very, very small portion of the US but before we went, I found it so helpful to read other people’s recommendations. And on that note, a HUGE thank you to everyone who shared their tips and advice with me. Your comments, tweets and emails were so helpful and although I didn’t get to see everything that was recommended but just having an idea of what other people enjoyed helped us plan our trip perfectly. 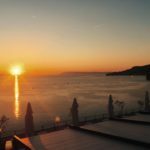 If you have any more to add please leave a comment – I’d love to think this post could help others with their own holidays. Those pics are seriously amazing!!! It sounds like such a fun trip! I want to go back to the US! I agree re wholefoods by central park, perfect for stocking up for a picnic! Love this post! I am definitely bookmarking it for my NY trip. I love getting recommendations as it saves a lot of time and means you never have to fall back on the “aimed at tourist” type places. 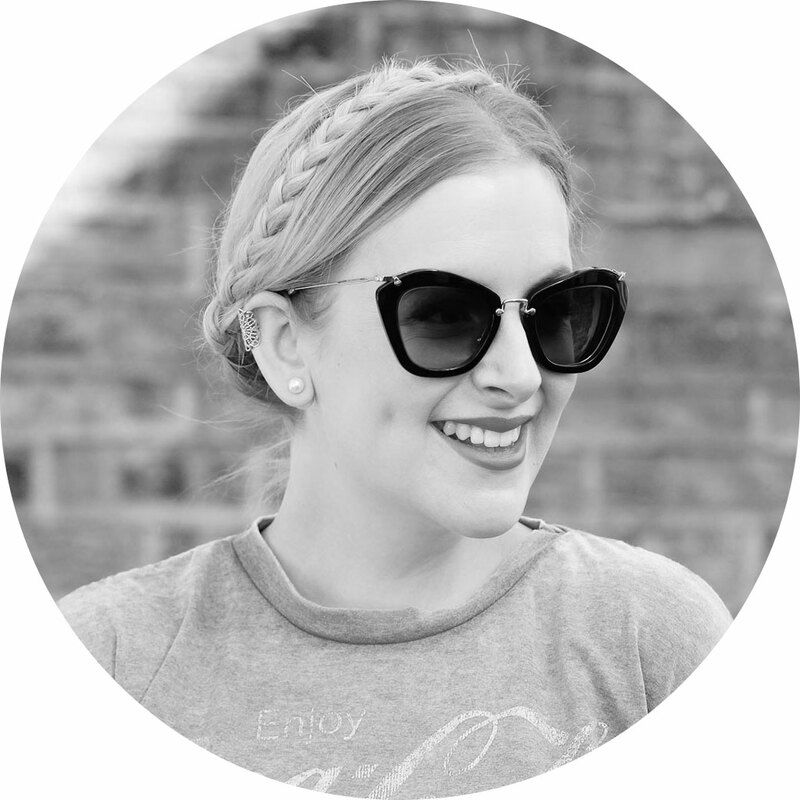 Your trip sounds so amazing Jen – definitely will be bookmarking this for when I (one day!) finally make it back over the pond! We’re off on a New England road trip in October and are currently trying to organise a route and book some hotels as they’re crazy expensive and filling up already for the ‘leaf peeping’ season. However, I am really trying to enjoy this part of the holiday as I know all too soon we’ll have been and arrived back in Manchester with just our photos and memories. You obviously had a wonderful time – I love seeing pictures of NYC, its an amazing city. Gorgy pictures! It looks like you had a ton of fun, and had some lovely fashion moments along the way! This all looks absolutely amazing Jen! Holiday of a lifetime =) you certainly seem to have planned it well! Thank you for these travel tips, one day I will go to America and I have this bookmarked for then! I have bookmarked all your NY stuff – planning to visit next year for our 10 year anniversary and I CANNOT wait! Wow, it all looks and sounds so lovely. I can’t believe how gorgeous Maine is and Chicago and Lake Michigan look really amazing! 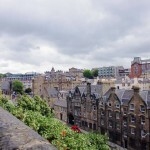 Great post, so informative and unlike the annoying travel brochure/guide ones we usually only get to see! Really want to plan a trip back to America in the next couple of years, I’ve only ever been to the West Coast!